Middlesbrough go into tomorrow’s daunting Premier League away game at Manchester City with confidence high and limited expectation. That combination, their manager Aitor Karanka believes, stands them in good stead to pull off a shock at the Etihad Stadium (3pm kick-off) and upset Pep Guardiola’s team on the back of their Champions League victory over Barcelona. 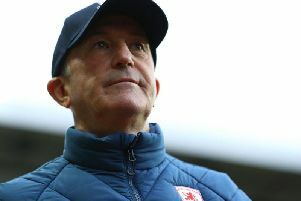 Memorably, Boro, then a Championship team, beat City 2-0 in the FA Cup two seasons ago, but this league encounter will be much different, Karanka says. Either way, Boro are riding a wave of positivity, following last week’s fine 2-0 win over Bournemouth. “Yes (the players are more confident after beating Bournemouth) because if we’d lost everything would have been different,” Karanka said. “But with three points the atmosphere is different, the players can be more confident as looking at the table – 10 points is much better than seven. “Now, adding points is easier, the reaction we had against West Ham after losing was good. “It’s the same Man City as I talked about when we went to Arsenal. We’ve been working for three years to play this fixture so we’re looking forward to it. Karanka’s side drew 0-0 with Arsenal in their last away outing, a result that came after a series of good performances that convinced the Spanish manager that his side were familiarising themselves with the top-flight’s demands. “Our performance last week at home was good, and so was the game against Stoke,” he added. “We lost against Crystal Palace at home, but we should have at least drawn. Thankfully, the goals have now arrived. He has learned things from the Arsenal game that he can tell his players about City. “Both teams have good players and are really good teams, but their styles are different,” added Karanka. “One mistake would be to go there thinking we could have won against Arsenal and that it would be an easy game. Being in the opposite dugout to former Barcelona and Bayern Munich boss Guardiola excites Karanka, who praised his own adaptation to the league. He said: “I said that with Pep here the league was going to improve, and he’s showing how good he is. “He’s one of the best coaches, especially after the win over Barcelona – he’s changing.